Herman was the firstborn son of John and Clara (Troost) Bartels. 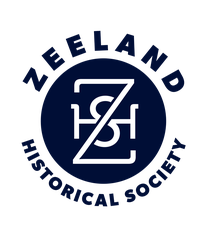 John and Clara arrived in the United States from the Netherlands in 1881 and 1882 respectively. They were married on October 28, 1892. Herman John Bartels entered the world on October 1, 1894. Very little is known of Herman’s early life in Olive Township. It is suspected that as a youth he aided his father on the farm that the Bartels owned on Tyler Street. As a young man, Herman worked as a hired hand on other farms in West Michigan. When President Wilson called for the Draft, Herman registered on June 5, 1917. He recorded his place of residency as Olive Michigan and his occupation as “farm laborer”. At that time of his life, he was employed on a farm in Fillmore Township in Allegan County. Herman was known to have a sweetheart, but her identity is unknown. He reported for active duty at Camp Grayling, Michigan, for his basic training on August 16, 1917. Undoubtedly, tearful goodbyes were said before leaving. The troops were pushed to the physical limits at this camp located in the beautiful setting of Northern Michigan. Many of the officers who trained the men were veterans with combat experience from the Spanish American War. These officers strived to build pride in each of the companies. Following his training, Herman, along with many other West Michigan men that had trained at Camp Grayling, travelled by train to Camp MacArthur in Waco, Texas. The train departed Camp Graying on September 15 and made a brief stop in Kalamazoo, the hometown of their commander, Colonel Joseph Westnedge. The men participated in a short parade and then continued on to Waco. They arrived at Camp MacArthur on September 19, 1917. Here the men were formed into new companies of the 126th Infantry, 32nd Division. Many of the young men from West Michigan were originally part of Company L, but Herman was transferred into the 1st Battalion, Company D on September 29th. Sixteen weeks of training were completed at this camp as required by the “Infantry Training Manual”. Training included all the various weapons, digging trenches and gas training. The gas training included walking through a gas chamber filled with deadly gas, wearing a gas mask. Herman and all his fellow troopers lived in canvas tents the entire time in Waco. Training also included night marches of over 20 miles with full packs. The 126th took their next step toward war on January 2, 1918 as they traveled by train to Camp Merritt in Hoboken, New Jersey. Here the unit was plagued with measles, mumps and scarlet fever, resulting in all the men being quarantined and their passes to New York City cancelled. On February 15, Herman shipped out for Europe on the U.S.S. Grant, a seized German vessel. Fifty-three hundred men were aboard for the 3 week journey. Company D disembarked in France on March 6th and boarded a train for St. Nazaire, France where they temporarily put aside their training and worked as construction crews to build roads, railroad yards and docks to support the war effort. On April 8, the 126th Infantry was sent to Divisional Training. On May 14, Herman’s training ended abruptly and the first Battalion headed for a secret destination toward the front lines. The first evidences of war were bombed out buildings and the sight of French and German planes battling in the air behind the lines. Finally, on the night of May 20-21, the yanks moved into the trenches, replacing French troops. From May 21 through July 18 the 126th Infantry occupied the trenches in the Alsace Sector with little action. During this time the unit suffered its first deaths, primarily from enemy artillery. They saw 10 days of rest behind the lines and then were trucked to Chateau Thierry (part of the 2nd Battle of the Marne). On July 31st, Herman and the rest of the 1st Battalion made their first attack against the Germans. It was over open ground toward Hill 212, advancing from shell hole to shell hole, that they spent the night without sleep. 1The next morning, August 1, was a memorable day, bringing the hottest fighting of the war for the 126th Infantry. Herman’s Company D along with Company C led the attack. It was launched at 3:30 in the morning and lasted most of the day. From Company D alone, there were 80 battle casualties (15 killed and 65 wounded). Historians state that many brave deeds were performed that day that have never been recorded. For the remainder of the first week of August, the 126th continued to press the enemy. They experienced continual small arms engagements, artillery bombardments, gas attaches and went without hot food. Food was obtained by using reserve rations or taking rations from the German and American dead. During this week of constant battle, approximately 1/5 of the 126th Infantry Regiment was killed (76) or wounded (671). The regiment was relieved on August 7 and rested until August 11. They then began training in new formations from August 12 through the 24th when they were trucked to a new sector of the front lines near Juvigny, France. On the morning of August 28, the 126th was part of a full scale attack that left 67 killed and 120 wounded. On August 29 and 30, 1918, the attack was resumed. 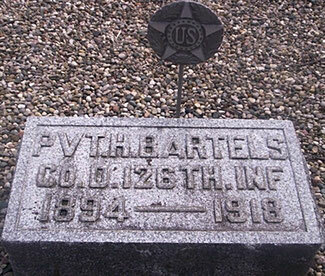 It was on Friday, August 30, 1918, that Herman Bartels was killed during the fighting for Juvigny. It is believed that he was shot in the head by a sniper. 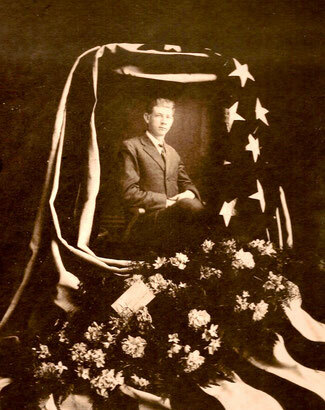 Herman’s body was buried with the other slain soldiers of the 126th Infantry. His body remained interned in a temporary military cemetery in France until late December 1920. It was returned to Holland Michigan where a military memorial service was held on Tuesday, January 4, 1921, to remember and honor him. His body now lies in the Olive Township Cemetery. Pvt. Co. D, 126th Inf. 1 "The next morning, August 1, was a memorable day, bringing the hottest fighting of the war for the 126th Infantry." It was on August 1, 1918, that Gilbert D. Karsten was killed in action at the age of 20. 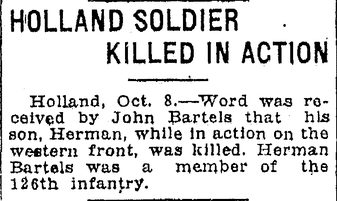 He was the first World War I casualty from Zeeland. Corporal, Co. M, 126th Inf.